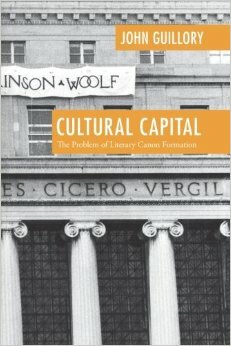 John Guillory's Cultural Capital: The Problem Of Literary Canon Formation (University of Chicago Press, 1993) is not just another book about the canon debate in the U.S. academy. Rather, it is an uncompromising study of the problem of canon formation itself and what that problem tells us about the crisis in contemporary education. Rather than concentrating only on local motives for the inclusuion or exclusion of particular texts, Cultural Capital poses larger questions of canon-formation as a process in its own right, in both its historical form and the contemporary debates that surround it. Using Pierre Bourdieu's sociology of culture as its model, Guillory's book brings back the issue of class in canon formation, not in simplistic assumptions about class interests supposedly represented in texts, but in the status-conferring functions of the school. In the context of the polarized debates of academic literary study, Cultural Capital achieves a welcome unpleasantness by refusing to leave the site of the debates unquestioned; it looks instead to the academy as a social institution and reads the history of the debate in that context, examiniing the categories of both literature and theory within the politics of the academy. Finally, by rehistoricizing the history of the "aestheic" in the context of eighteenth-century discourse on political economy, the American New Criticism, and the Paul de Man affair, Cultural Capital rejects the easy reduction of the aesthetic to "use value," and makes an impassioned case for the study of literature.